I’ve been meaning to share with you my new shaker I ordered! 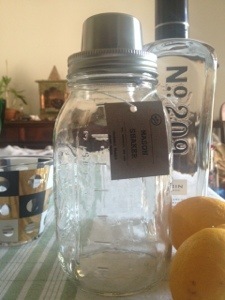 It repurposes a Mason Jar into a cocktail shaker! How cool is that? Once Lent is over I will give it a whirl..I mean shake! Two guys from the South, who now live in Brooklyn, organized a Kickstarter for their invention. You can read more about it here. This entry was posted in Food, Gluten Free, My Home and tagged cocktails, gin and tonics, Mason Jars, Mason Skaker on February 27, 2013 by amybailey aka knitsakes.